I have a new futures trading entry for this futures blog. I have entered a short term long natural gas trade. Entry price was 3.20 at 9:42 in the morning, my time. I'd like to talk about what happened in the natural gas market at around 19:55 ET on the evening of January 1, 2013. This would have been the overnight session preceding the Jan 2 trading date. 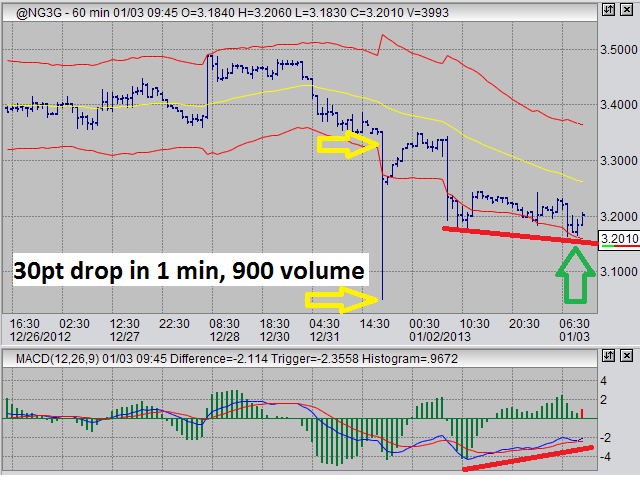 We saw a 30 point drop occur in 1 minute on a trading volume of 900 for that minute. Natural gas price regained 20 of those 30 points within that single minute, but still, the prices were reached and stops were triggered. The minute closed at a 10 point loss from the minute prior. I know this because I have the 1 minute chart as one of my defaults in natural gas, along with 10 minute, 60 minute, daily all on my real time streaming quotes online trading platform, and weekly on a separate website. I don't trade on the 1 minute chart, but I find it useful and interesting just for watching. Since the 30 point in 1 minute spike down, we have seen prices settle about 20 points, of the original 30 points, below from where the price spike started. The starting point of the price spike was a significant support area, and it is because it was significant that the spike occurred. Let me explain. For about two weeks, natural gas prices have been holding up at around the 3.32 level (Feb contract). The price spike happened just as prices dipped below 3.31. What does this mean? All this paints a very clear and simple picture, either one big-wig trading 900 contracts had his stop placed to sell at the market at 3.31, or a bunch of people had several stops to sell at the market in the vicinity of 3.31 to 3.25. For such a dramatic drop to occur, I tend to lean toward the idea that it was one big fat juicy 900 contract dump on the market at the market. When this occurs, you can bet someone was on vacation or partying, because someone trading 900 contracts should know better and keep a more watchful eye. My trade in natural gas is long, and I bought at 3.20 at 9:42 in the morning at my regional time. 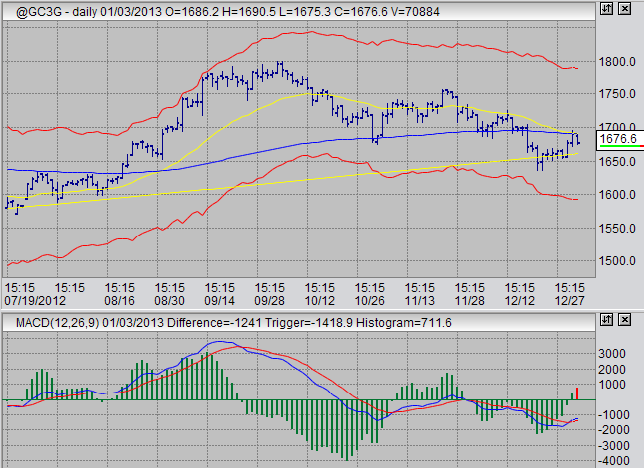 The trade was based on an MACD divergence that is clearly pointed out in the 60 minute chart below. If you can't see the MACD divergence, then go to MACD divergences to learn more about them. You might be thinking to yourself, "that's not a divergence, what about the price spike lows?". My answer to that is, the price spike was an anomaly, I am therefore ignoring it. I will treat the anomaly as though the low occurred where the bar ended, around 3.25, the remaining tail down to 3.05 is practically invisible to me. I may be doing this at my own peril, but hey, we have to make decisions in life and I am using stops in case I am wrong. If you want to work with perfect systems, trading isn't for you. Observe the following futures trading chart in February 2013 natural gas futures. In other markets, I am still bullish in sugar and looking for an entry there. Today we have seen a drop, and it may lead to a buying opportunity. Keep an eye on this futures trading blog to observe my sugar entry, if and when it occurs. I am still long gold from my gold trade on Dec 28, 2012. My sentiment in that market is longer term bullish, which is why I am positioned in the December 2013 contract. We saw very positive behavior the two days following my trade, and today there is some stalling. The gold trade is essentially a long term swing trade using weekly charts. Let us look at a futures trading daily chart for this market. MACD is behaving nicely. We should see some resistance at the yellow and blue moving averages for a few days. I am watching this trade very closely for indications that the market might set new lows. I must admit, I'm a little uncomfortable with the downside I've seen today. I would have liked to see a tighter range. My first warning sign is that prices were unable to move above the moving averages that I have set. I have stops set here, but I would prefer to stay in this market. Again, this is a long term position. I am looking for months here, but I will exit if I have to. Note: I am position in the Dec 2013 contract, the chart above is for the February 2013 contract. There is an approximate price difference of 10 points, higher for Dec.